* WE ARE PRIVATE OWNER/MANAGERS Crown Towers, one bedroom apartment.Features spacious living and dining area, equipped with modern appliances, two flat screen LCD TVs , DVD and CD player, large bathroom and balcony. City and some ocean views. Tastefully furnished and air conditioned. Further attractions include a pirate themed childrens' pool, gymnasium, in-door heated pool, spa, sauna and games room. Sea World, Warner Bros Movieworld, Dreamworld, Wet 'n, Wild, Currumbin Wildlife Sanctuary, Sanctuary Cove, Jupiters Casino, Pacific Fair. Breath-taking Gold Coast hinterland canal cruises, rain forest parks and a host of other attractions. Excellent location however being across the road from the jump meant that every night was noisy with teenagers screaming on the rides. Not ideal when putting children to sleep at 7.30pm. 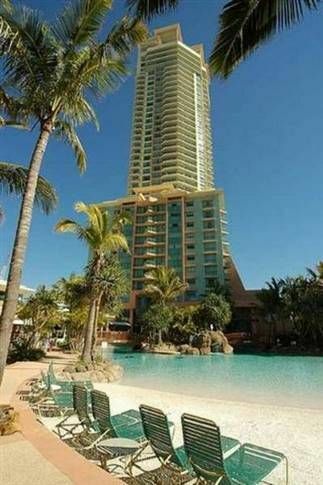 Otherwise the property is in good walking distance to Cavill Avenue and the swimming pool/sauna are great. Unfortunately our privately owned room wasn't clean. Within 5 mins drive to SeaWorld, 2 mins walk to surf beach. 3 In house pools for the kids, basement car parking. Neat and tidy room with south east ocean veiws. For the price it stacks up very well. Frank the owner was very accomodating and easy to deal with!! Apartment was perfect for our needs. Hotel though expensive for Internet use! No premier tv channels if that's important. The apartment was older but everything functioned as it should. Was great value for the price. We enjoyed our stay and would definitely stay again. Stayed for 6 nights on the 8th floor apartment with young child. Great value for what it costs. Hotel has a lot to offer with a couple excellent Cafe's/ restaurants and beautiful pool areas. Room is comfortable for a basic apartment at a good price! Very smooth transaction with no dramas, recommend to others. Very happy with our stay indeed. The kids loved it. Enjoyed all the facilities and everything they had to offer. Very nicely designed lobby. The owners were great, very helpful, great communication and service. Apartment was very nice, spacious for a family of four, great views, we were right opposite the Sling Shot and Vomatron. Loved the large lagoon pool and the kids pirate ship water slide pool. Great experience, wonderful holiday, everything was perfect for us. Highly recommended. 5 Stars!